Eddie Constantine (born Edward Constantinowsky; October 29, 1917 – February 25, 1993) was an American French actor and singer who spent his career working in Europe. He was born in Los Angeles to Jewish immigrant parents, a Russian father and Polish mother. In pursuit of a singing career, he went to Vienna for voice training, but when he returned to America his career didn’t take off and he started taking work as a film extra. Having failed to make a career in America, Constantine returned to Europe in the 1950s and started singing and performing in Parisian cabarets. He was noticed by Edith Piaf, who cast him in the musical La p’tite Lili. Constantine also helped Piaf with translations for her 1956 album La Vie En Rose/Édith Piaf Sings In English, so that he has songwriting credits on the English versions of some of her most famous songs (especially “Hymne à l’amour”/”Hymn to Love”). 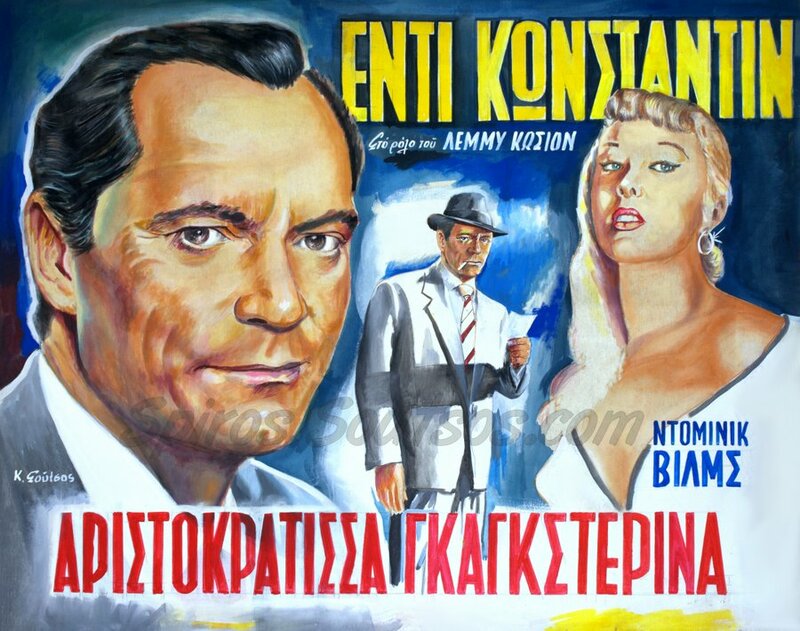 In the 1950s Constantine was a great star in France due to his role as the hard-boiled detective/secret agent Lemmy Caution (from Peter Cheyney‘s novels) in a series of French movies, including “La môme vert-de-gris” (1953), “Cet homme est dangereux” (1953), “Ça va barder” (1953), “Les Femmes S’En Balancent” (1954), “Je suis un sentimental” (1955), “Lemmy pour les dames” (1961) and “Your Turn, Darling” (1963). Constantine eventually became a French citizen and enjoyed great popularity in several European countries, including France and Germany. When not playing Lemmy Caution, Constantine’s character would still typically be a suave-talking, seductive, smooth guy, although he often played this for laughs. He turned his accent and perceived American cockiness to advantage in such roles, and later described his film persona as having been “James Bond before James Bond“. One of his most notable roles was in Jean-Luc Godard’s Alphaville (1965), in which he reprised (to a more radical end) the role of Lemmy Caution, in a departure from the style of his other films. His box-office appeal in France waned in the mid-1960s. Having remarried to a German television producer, he eventually relocated to Germany, where he worked as a character actor, appearing in German TV dramas as well as film. Constantine later claimed he had never taken his acting career seriously, as he considered himself to be a singer by trade, and had been an actor strictly for the money. He nevertheless worked with directors such as Godard and Rainer Werner Fassbinder, and his last notable film appearance was in Lars Von Trier‘s Europa in 1991.